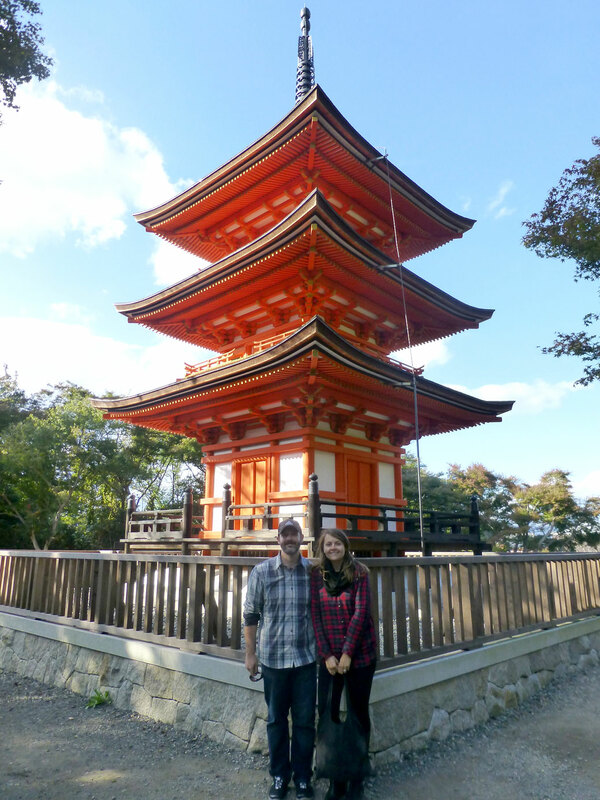 After two wonderful days in Osaka, we set out on the second-half of our Kansai adventure, bound for Kyoto. But first, coffee! 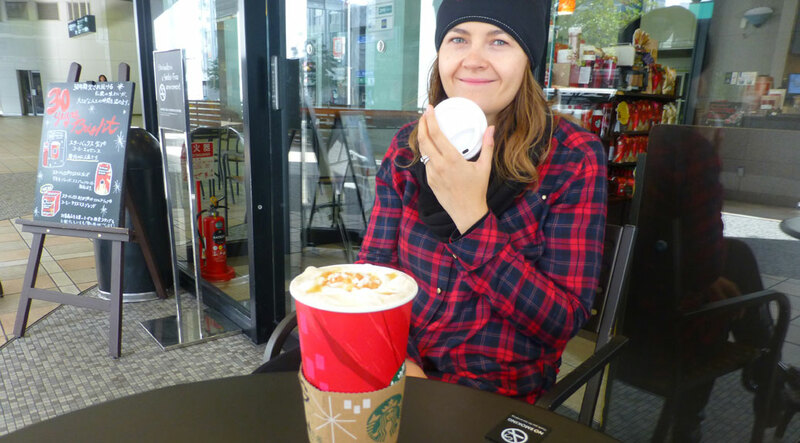 I only mention the coffee stop because it was the morning of November 3, yet the Starbucks at Temmabashi Station was already decked out for Christmas with an updated drink menu and American holiday music blaring through the speakers. But, as the saying goes: “When in Starbucks, do as the Starbuckians do.” We ordered the seasonal Snow Maple Toffee Latte, a take on a Canadian/New England treat called Maple Taffy (which the internet says is made by pouring boiling-hot maple sap over snow). With a lethal dose of caffeine and sugar coursing through our veins, we boarded the Elegant Saloon 8000 express train to Kyoto. Other than the comfortable forward-facing seats, I didn’t notice anything particularly special about the train, but all along the 30-mile route, photographers with tripods and $10,000 lenses were set up, waiting to capture a photo of the train with the hills of central Japan in the backdrop. I snapped a horrible photo of the train once we arrived in Kyoto because it seemed like the right thing to do. 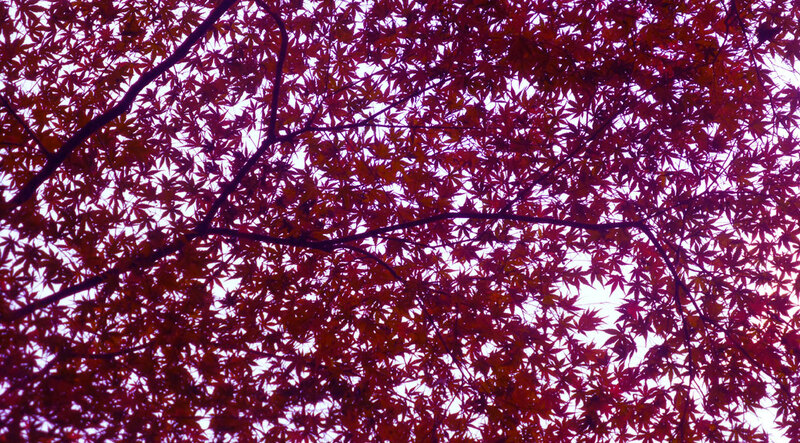 So, right… Kyoto. An amazing, dynamic and diverse city, the former imperial capital of Japan boasts more than 2,000 temples and 17 UNESCO World Heritage Sites. We intentionally scheduled our trip for early November to see the sights surrounded by the changing colors of autumn and we were not disappointed. We started our day at Fushimi Inari Taisha, the shrine dedicated to the kami (god) of rice (among other things). 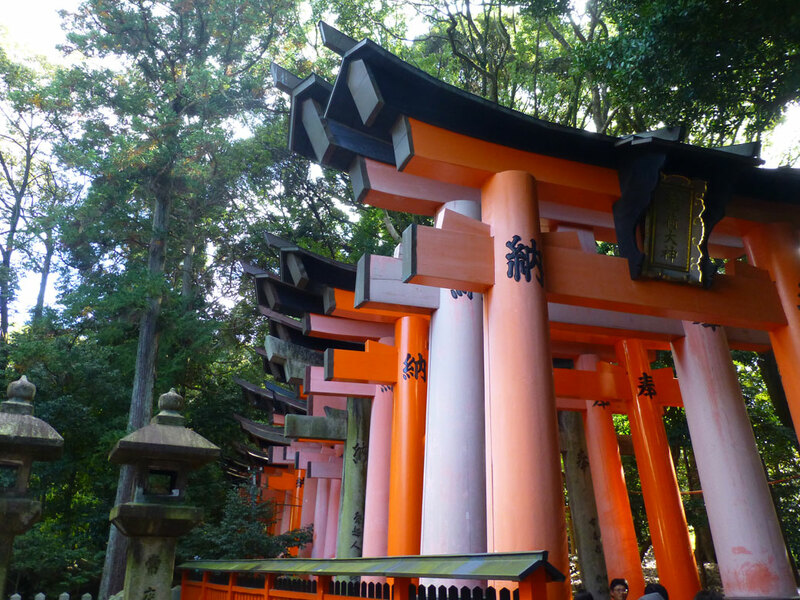 The shrine is famous for the thousands of torii (shrine gates) that lead to the inner shrine in the middle of Inari Mountain. 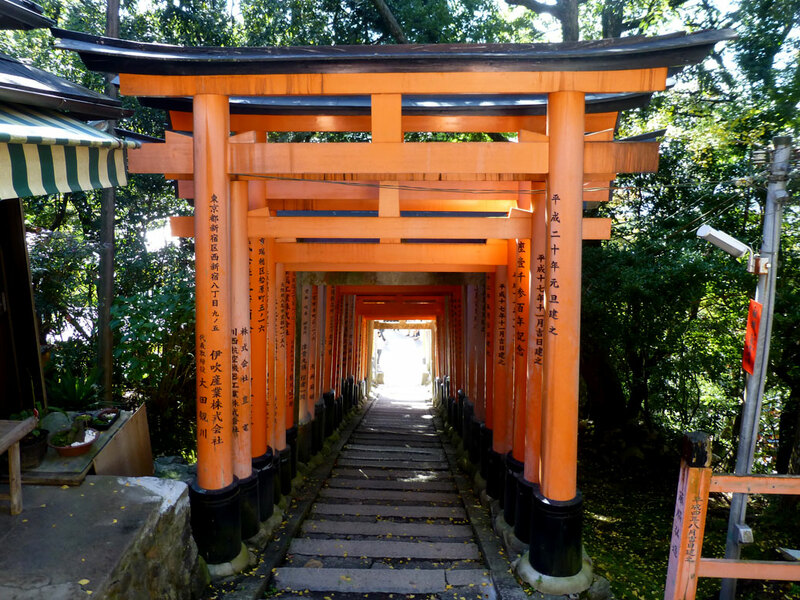 Inari is also the kami of industry, so in an offering to the god, Japanese businesses have donated each of the torii. Each gate is marked with the date it was placed and the name of the donating company. To the uninformed foreigner (us), you’d probably assume the words to be something spiritual. However, to the Japanese-literate, it’s an endless string of advertisements. Pretty cool advertisements though! We spent a couple hours hiking up/down the trail to the middle of the mountain, where a view of the entire city opens up. We stopped for lunch, which of course included inari sushi (a fried-tofu pouch filled with sushi rice, named for the kami). 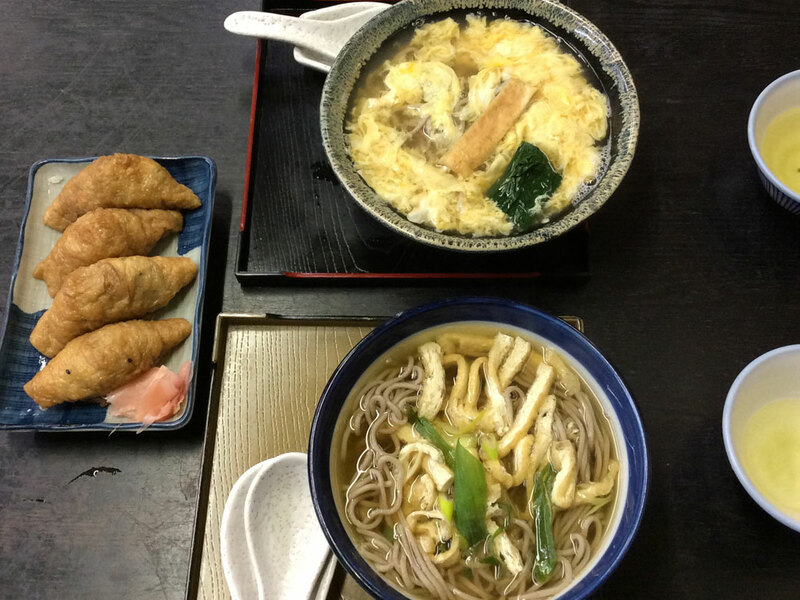 We also had a bowl of kitsune soba. Kitsune is the Japanese word for fox. Foxes play a significant role in Japanese folklore. They’re also said to be fond of aburage (fried tofu), hence the namesake dish. 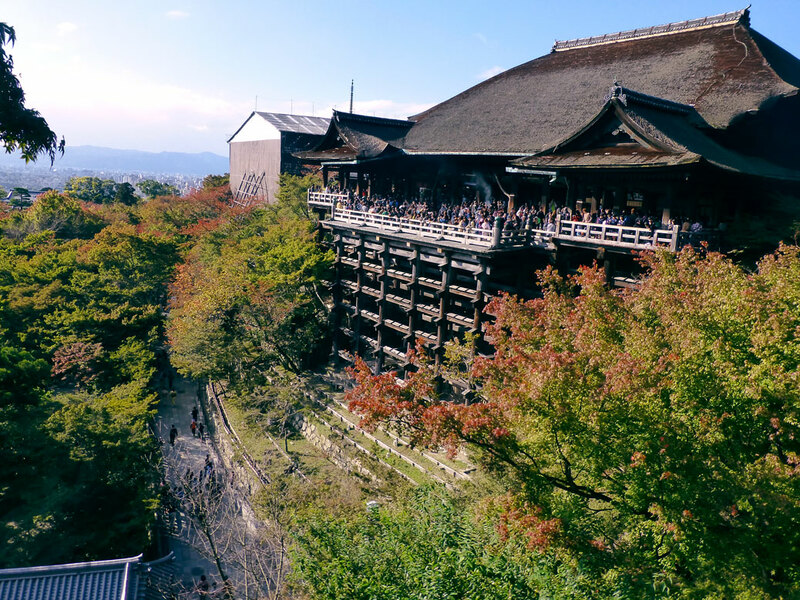 Kiyomizu-dera is a Buddhist temple in eastern Kyoto. One of the UNESCO sites, its current structures date back to the 1600s. The impressive main hall, with its large veranda designed to accommodate thousands of pilgrims at any given time, was built without a single nail. I’m a big fan of the Buddhist temples and the smell of incense that fills the air. Despite the large crowds (turned out we were there over the Culture Day holiday weekend), there’s still plenty of opportunity to find a moment of Zen. Two separate groups of students practiced their English on Viktoria. They were clearly unimpressed with me. One (or two) such moments occurred when small groups of students descended on tourists to practice their English. They asked three pre-written questions with no follow-ups. The shrines and their large crowds must be popular for this homework as we experienced this in Asakusa back in May as well. The earnest students left a good feeling as we ventured into the temple. From the veranda of the main hall, you can see a grand view of the city and, across the way, the temple’s lonely pagoda rises from the trees. A scenic walk leads to the pagoda. 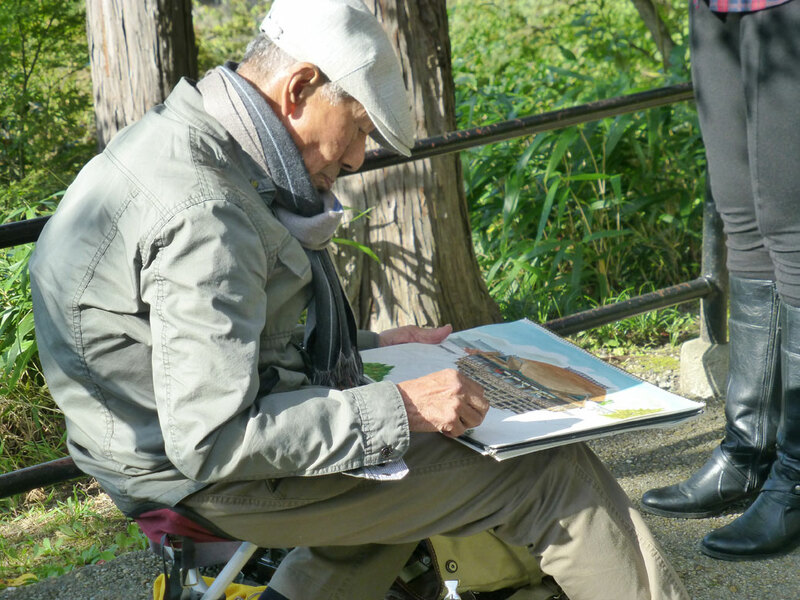 An older Japanese man sat near the trail, oblivious to the crowd around him as he made a beautiful color sketch of the iconic main hall. We reached the pagoda after a lovely walk, where I’ll admit to committing a cultural faux-pas. A very nice lady of Asian decent was snapping photos of her travel companions by the pagoda, so I asked her if she would take our photo as well. Me: Shasin wo totte morae masu ka? Her: I’m sorry, I don’t speak Japanese. Shoot… As a person who is offended by the general clumping of cultures, I felt terrible, but she didn’t seem to mind. I’m guessing it’s one of those things that the other person doesn’t think twice about, while you beat yourself up over it for a couple days. The picture turned out lovely though! 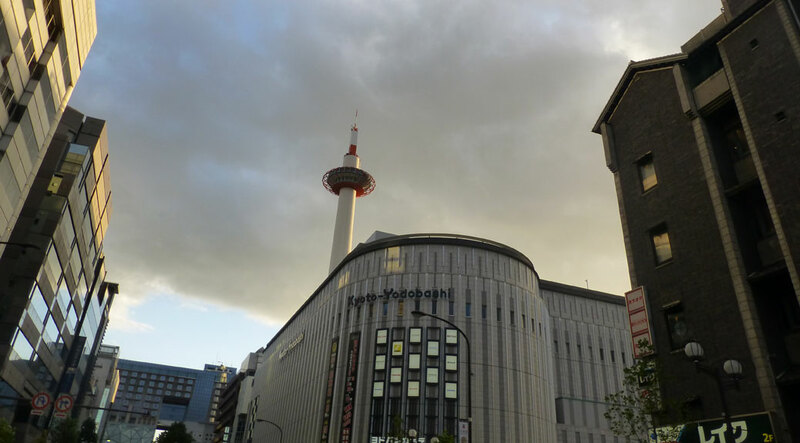 We headed to our temporary Airbnb home near Kyoto Station. We’d need to rest up with two days and 2,000 temples to see.